In June of 1926, the two oldest automotive manufacturers, Daimler Motoren Gesellschaft (DMG) and Benz & Cie, merged to become Daimler-Benz AG. In October of that same year, the first jointly developed passenger car models were released under the Mercedes-Benz name. The MBU collection offers a classic collegiate look with each piece citing the phrase "since 1926" as a tribute to the history behind the modern day name of the manufacturer at the forefront of luxury vehicles- Mercedes-Benz. 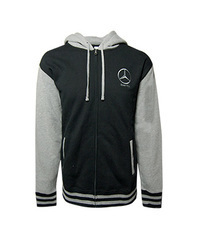 This MBU sweatshirt jacket wraps its wearer in premium comfort.